Study Abroad and EARN A MINOR! Click the image to see larger. Information provided by the National Humanities Alliance. Humanities majors achieve substantially greater gains than business and technology, engineering, and math majors in writing ability, complex reasoning, and critical thinking—skills that today's employers are actively seeking. 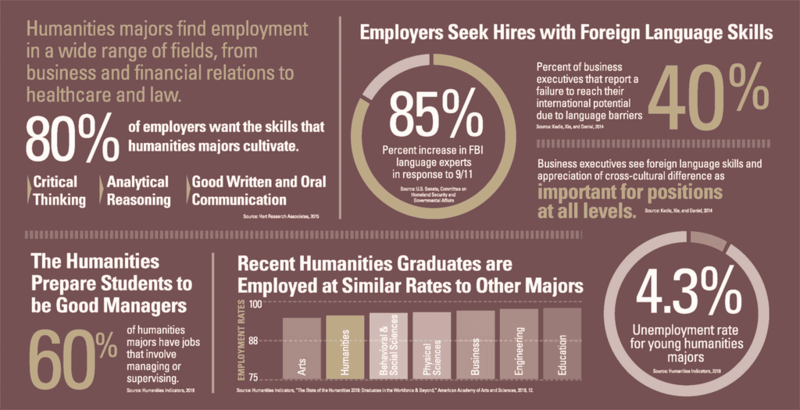 What do business leaders and entrepreneurs say about the Humanities? "It's in Apple's DNA that technology alone is not enough. It's technology married with liberal arts, married with the humanities, that yields the results that make our hearts sing." Steve Jobs, Co-Founder and former CEO of Apple Inc.
"If we really want to reinstate a true state of innovation in the United States, we have to find a new way to bring the humanities much more forward into our thinking...."
"There is a need for creativity and innovation of a different type that might not simply come from math and [the] sciences...."
Businesses want workers who have "the ability to think, the ability to write, the ability to understand the cultural or historical context of whatever business decision they're making." Humanities majors "can often more accurately understand the human dynamics that drive stock market flows." "I believe humanities majors make the best project managers, the best product managers, and, ultimately, the most visionary technology leaders." "In my experience, a background and aptitude in linguistics or philosophy has always been a superb marker for a successful hire. I have found the conceptual and analytic skills honed by these disciplines to be better predictors of success than any particular technical skillset."